Syrian opposition activists say scores of bodies have been found in a town near the capital, Damascus, accusing government troops of a “massacre”. Many of those killed in the town of Darayya were victims of execution-style killings, the activists said. According to unconfirmed reports, 200 bodies were discovered in houses and basement shelters. Without commenting on the activists’ claim, Syrian state TV said Darayya was being “cleansed of terrorist remnants”. Meanwhile, Syrian Vice-President Farouq al-Shara has greeted an Iranian delegation in Damascus, quashing weeks of speculation that he had defected to the opposition. President Bashar al-Assad, who also met the Iranian delegation, said Syria would continue its current policy “whatever the cost” and accused Western nations of a regional conspiracy. The forces of President Bashar al-Assad launched an assault on Darayya on Saturday, after days of heavy bombardment. The attack was part of a wider campaign to reclaim the southern outskirts of Damascus, where rebels have been regrouping since being driven out a month ago. 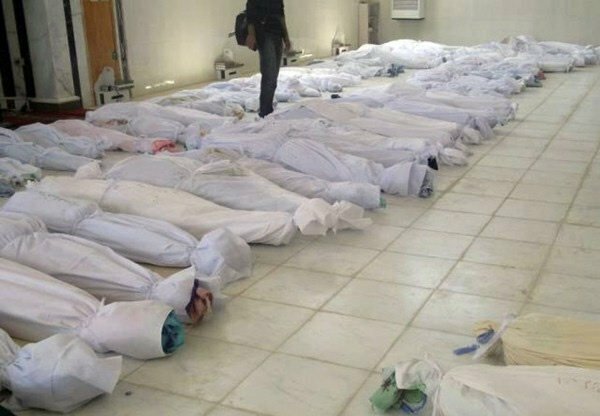 Activists on the ground later posted unverified video footage on the internet, which shows rows of bodies side by side in the Abu Auleiman al-Darani mosque. The activists say that many of the victims had gunshot wounds to the head and chest and were killed during house-to-house raids by government troops. “Assad’s army has committed a massacre in Darayya,” an opposition member told Reuters. The activist added that most of the victims had been killed at close range, and some died from sniper fire. The opposition Local Coordination Committees group put the death toll for Saturday at 440 across Syria. Another opposition group, the Syrian Observatory for Human Rights, says 320 people were killed in Darayya over five days, not on Saturday alone. The claims by the activists have not been independently verified because of restrictions placed on foreign media across Syria. Meanwhile Vice-President Farouq al-Shara was seen entering his office for a meeting with an Iranian delegation, following weeks of rumors that he had defected. State media said a “fake” email had been sent out saying Farouq al-Shara had been sacked and that this was “completely wrong”. After welcoming the Iranian team, President Bashar al-Assad accused some Western and regional countries of trying to “deviate Syria from its stance”. Local activists say the type of mass killing reportedly carried out in Darayya, with dozens of bodies being discovered following government raids, has increased in recent months. Human Rights Watch said it was not a new pattern, but was now happening in more areas and in greater numbers. An earlier report from United Nations observers found that both sides had carried out massacres, but the Syrian army was responsible for a far greater number of deaths. Fighting continued in other parts of Syria on Sunday, including in the second city of Aleppo, where fighter jets dropped bombs on rebel-held positions in what was described as the fiercest fighting there in the past week. In a separate development, the head of the UN mission to Syria left the country after the mission had been wound up. Senegalese Lt. Gen Babacar Gaye joined a UN convoy to Lebanon on Saturday. Last week, the UN decided against extending the mission, which was originally part of a six-point peace plan for Syria. However, the ceasefire mandated by the plan never took hold and rising violence forced the UN monitors to be confined to their hotels since June.